Buy Dianita a Coffee. ko-fi.com/artbydianita - Ko-fi ❤️ Where creators get paid by fans, with a 'Buy Me a Coffee' button. Hi! I'm a Mexican artist and I make fantasy art. 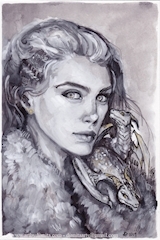 I love to draw and paint women with dragons, horses and other beautiful animals. I occasionally make fan art from World of Warcraft, Overwatch and other stories I love! Hi! Welcome to my new Ko-fi! I make art because it brings me peace and joy, and I love when my work inspires others to keep creating! If you feel my work brings something positive to your life, please consider supporting me! I don't drink much ko-fi, I prefer to buy sketchbooks and art materials! Secured Payments. Support goes to Dianita's account. Upgrade Dianita to a yearly Gold Membership with a one-time payment.